During World War II, American victories on the Philippine island of Leyte and a lopsided naval victory in Leyte Gulf in October 1944 opened the way for the invasion of the Philippine Island on this day in 1944. Americans warships encountered attacks by Japanese suicide boats packed with explosives. These boats, piloted by kamikaze troops, rammed the light cruiser Columbia and the battleship Mississippi, causing little damage but killing 49 American sailors. Once inland, American troops fought their way through a stiff defensive network of caves and tunnels. One solider, left in the jungle for days, listening to American voices yell, "Help me, Joe, I'm dying..." knew it was one of the tricks Japaneses used to pull them out of hiding and shoot them. He had seen it all-too-many times. So he stayed hidden listening to the voices all night, and once even noticed that there was a split second of time when it is neither night or day, where light and dark meet, just as the sun is about to rise. He termed that moment, "The Twilight Zone." 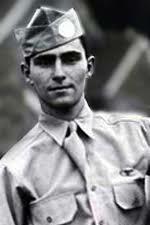 That young paratrooper of the 511th Parachute Infantry Regiment was Rod Serling, the creator of The Twilight Zone television series. "Infantry platoon, U.S. Army, Philippine Islands, 1945. These are the faces of the young men who fight, as if some omniscient painter had mixed a tube of oils that were at one time earth brown, dust gray, blood red, beard black, and fear - yellow white, and these men were the models. For this is the province of combat, and these are the faces of war." 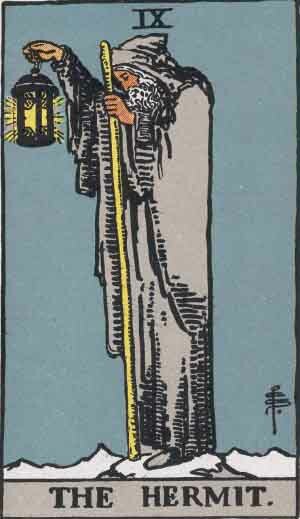 The 9th card of the Major Arcana is The Hermit, who is usually depicted walking with a lantern and a stick; he represents meditation, islation and quietude. The card also signifies crystallized wisdom and ultimate discipline. 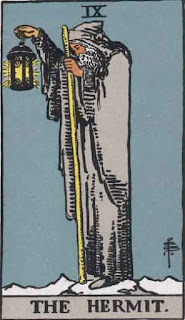 The Hermit is a taskmaster who motivates by conscience and guides others on their path.